Female; 25 – 35 years old; Graduate of BS Human Resource Management; With 5 years experience. Male; 18 years old and above; At least College level; With experience in a manufacturing company. Preferably Male; Physically fit with good body built; Ability to rapidly manipulate small parts and use power hand tools; Ability to lift 55 lbs. and performs repetitive motions of bending, pushing, grasping and pulling; Good hand-eye coordination, concentration skills and demonstrated attention to detail; Proven ability to work in a flexible work environment and adapt to overtime requirements as needed; Must have good English communication skill; Has a strong ethic. Female; 21 – 30 years old; Graduate of BS Accountancy; Computer literate; Working experience in a Retail company is an advantage; Flexible and physically fit; Willing to be trained. Male / Female; At least 30 – 50 years old; Graduate of Bachelor of Law and a Bar Passer; At least 2 years experience in litigation / practice of law; Must posses strong personality; Willing to be relocated in Subic or Olongapo City. Female; Certified Public Accountant (CPA); Not more than 38 years old; With at least one(1) year accounting and audit experience is an advantage; Has knowledge with BIR taxation; Computer literate; Hardworking and can work with minimal supervision; With good oral and written communication skill; Willing to be relocated in Zambales area. Male / Female; Between 25 – 35 years old; Political Science or any related course; With at least 3 years related working experience under Human Resource / Legal Section; Must posses strong personality; Smart, flexible, hardworking and with good communication skills. Male; Between 21 – 35 years old; Graduate of any Engineering course; Familiarity with process management is an advantage; Smart, flexible, hardworking and with good communication skills; Willing to be relocated in Subic or Olongapo City; Fresh graduates are welcome to apply. Male; 21 – 35 years old Female 21 – 28 years old; At least High school graduate With SBR License; BS Criminology graduate (for those without SBR License); With related experience as Watchman / Security is an advantage but not required; With good health condition. Male; At least 21 – 35 years old; At least College level; with BOSH training and/or Basic Life Support is an advantage; Smart, flexible and hardworking; With good communication skills. Female; 21 – 25 years old; BS Nursing graduate and with PRC Holder; With hospital / clinical / medical emergency service work experience is an advantage; Physically fit; Computer literate; With good interpersonal skills; Fresh graduates are welcome to apply. Female; Graduate of any four(4) year course; With administrative / clerical experience is an advantage; Computer literate; With good interpersonal skills; Fresh graduates are welcome to apply. Male; At least 21 and above but not more than 50 years old; At least High school graduate; With Professional Driver’s License with restriction code #8; With solid experience in operating forklift and/or trailer equipment is an advantage; With TESDA Certification is an advantage; Physically and mentally fit to work; Willing to be relocated in Subic or Olongapo City. Male; 18 – 35 years old; At least High school graduate; With TESDA Certification is an advantage; Physically and mentally fit to work; Willing to be relocated in Subic or Olongapo City. Male / Female; Must be 18 years old and above; At least High school graduate; With or without experience; Willing to render overtime. Graduate of any 4 year course; At least 25 – 30 years old; Be able to communicate and understand the predominant language(s) of the restaurant’s trading area; Have knowledge of service, food and beverage, generally involving at least three(3) years of front-of-the-house operations and/or assistant management positions; Possess excellent basic math skills and have the ability to operate cash register or POS system; Must be able to work opening, mid, and closing shifts if business demands, including holidays; Must have extensive experience as Restaurant General Manager and background on a casual dining set-up. 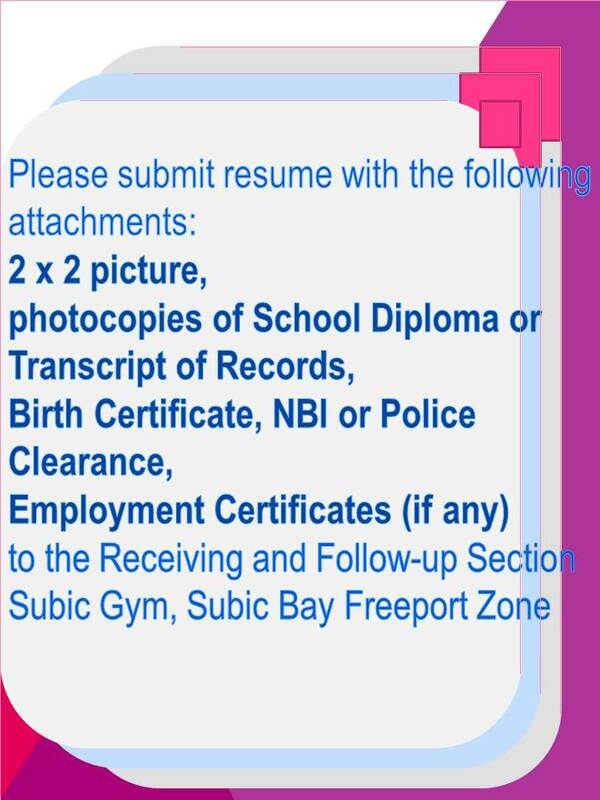 Must obtain a Bachelors Degree in related field or equivalent experience; Demonstrated ability to effectively supervise and motivate a team; with passion for the business and for sales; Excellent communication/customer service skills; Self Motivated Approach with a “Desire to Win”; Willing to be relocated in Olongapo City. Preferably Female; 22 – 34 years old; College level or graduate of any Business related course; Preferably with knowledge or experience in cashiering for at least one(1) year; Highly skilled in providing a timely, efficient, and considerate customer service; Proven ability to operate cash register and manage drawer; Demonstrated ability to respond and resolve customer’s request and concerns; Able to assist customer with purchases and transactions; Meticulous competency in sales, product and services; Excellent written and verbal communication skills; Ability to develop strong customer relations; Accurate with math and currency; Can operate Point-of-sales (POS), credit cards, and debit card transactions. Preferably Male / Female; Not more than 35 years old; Must be a graduate of BS Accounting or Finance, CPA is an advantage; Must have a 3 – 4 years of experience in the income audit and internal policies audit; Must have solid background in conducting audits of functions, preparing audit reports and directing audit activities; Must have an experience in the operations of the treasury and operational systems Willing to be relocated in Olongapo City. Must obtain a BS in Accounting or Finance course; Must be a Certified Public Accountant (CPA); ust have two(2) years audit or four(4) years accounting experience in Accounts Receivable, Accounts Payable, Payroll and Taxes, Collections, Business Taxes and Financial Statements; Must possess good fundamental understanding in all facets of accounting and be proficient in any computerized bookkeeping system; Should have a decidedly academic manner, enjoy detail and be organized; Must be able to work quick, clean and complete-no loose ends; Should be able to communicate well with others particularly management; Must meet deadlines. ; Must be able to manage a busy load of bookkeeping transactions and to complete daily work on time with few mistakes; Can work under pressure. Should be at least 19 – 24 years old; With pleasing personality; Must obtain at least a 2nd year level in College in any customer service related courses; Can speak Nihongo; With experience in customer service or in the food industry; Can work under pressure. Male; 23 – 38 years old; Should have Bachelor’s Degree in Food & Beverage Services Management or equivalent; At least 3 years of work experience in the Japanese restaurant; Must be hardworking, honest and responsible; With good communication skills; Can work under pressure. Must be 28 – 35 years old; Must be a Bachelor’s Degree in Civil Engineering; with License / Board passer is an advantage; Must have 5 years experience in the same field of working building, construction, roads or agriculture, environmental, draughting or surveying work, practical work such as site investigations or geotechnical testing; To be able to explain design ideas clearly and be well organized; Ability to analyze large amounts of data, and assess solutions; Should have confident decision-making ability; Project Management skills; Ability to work within budgets and to deadlines; Have full knowledge of relevant legal regulations. Preferably Female; Not more than 35 years old; Must be a graduate of any 4 year business course; with at least a year of related experience or equivalent; Must have a customer relations job experience; Must be willing to work on a shifting schedule; With pleasing personality; Can work under pressure. Female; Graduate of any 4 year course; With experience is an advantage; Willing to train and to be trained; Capable of handling pressures and multiple task.